The story has been told thousands of time in the same way: the Fathers of Confederation met in Charlottetown and Quebec in 1864 and laid the groundwork for Confederation. These were men of vision who, according the video shown at the PEI legislature, had few major disagreements and passed the time in congenial discussions while crafting the framework for the new nation. From George Brown to George-Étienne Cartier to John A. Macdonald, Canada was born out of the minds of the men who convened in 1864. Or at least that is the interpretation presented to grade-school kids across the country. But why stick to that narrative? This doesn’t necessarily mean we have to denigrate the Fathers of Confederation (based on the over-the-top interpretation of the aforementioned video, such a task would be impossible), but we can at least look at the years and events leading to Confederation from a different perspective – although this one may be historically problematic. Through the summer Prince Edward Island held a variety of celebratory events commemorating the 15oth anniversary of the Charlottetown Conference. The celebrations ranged from musical acts to visual art to culinary displays and went beyond merely telling the story of what happened in 1864. In a lot of ways it was really a celebration of the province as a whole and its place within Canada. 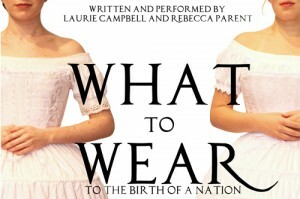 One aspect of the celebration that did re-visit the Charlottetown Conference, however, was the theatrical production ‘What to Wear to the Birth of a Nation.’ Written and performed by Laurie Campbell and Rebecca Parent, the show looked at the Conference from the perspective of the women who were on hand in Charlottetown. From their perceptions of a new nation to the daily realities of summer in PEI, the show examines these women’s presence and sheds light on the contributions that have not made it into the traditional narrative of the nation’s birth. 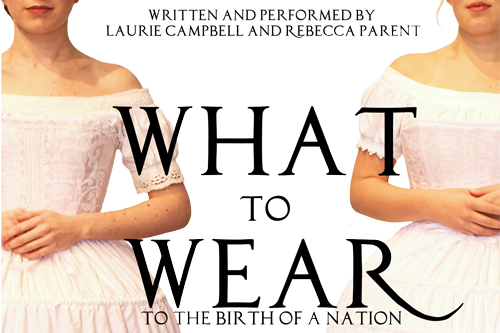 In this episode of the History Slam, Aaron Boyes and I are joined by Laurie Campbell to discuss ‘What to Wear to the Birth of a Nation.’ We chat about the writing and researching process, the challenges of doing a period piece, and the reception of audiences on PEI. The show toured across PEI this summer and if you are interested in bringing it to a town near you, do not hesitate to contact Laurie. Are you familiar with the film “Birth of a Nation?” Clearly, you don’t believe that Canada had no diversity in 1867. Griffiths’ film has long been a contentious debate on what it stood for and why it was filmed. It was a film that invoked emotion through its propaganda on race relations in the U.S. The history of emotions is an emerging field. I would be curious to know whether, you can write a secondary piece on emotions and Canada’s Confederation. Great podcast! Thanks for the shout out Dawn, I mean Sean – sorry, forgot your name there for a second. Thanks for your comments Nadine! I am familiar with Birth of a Nation – I’ve been able to include it in my courses on 20th century popular culture. The idea of examining Confederation through emotions is rather interesting and something I too would be interested in reading – particularly if it could be done from a bottom-up perspective.